From our stunning kitchen worktops range, Iroko worktops are a fantastic addition to your kitchen if you're looking for an exotic appearance that doesn't cost you a fortune to maintain. The Iroko worktops dark grains look fantastic in both rustic and ultra-modern kitchen designs. Iroko worktops are one of the most versatile and fashionable solid wood worktops we stock! Iroko wood is a beautiful African timber known for its rich caramel colours and high oil content. Thanks to this, Iroko worktops tend to need less maintenance to keep them looking pristine, and they're also more naturally resistant to bacteria. Over time, Iroko worktops will age into a rustic bronze colour, making your kitchen appear sophisticated and beautifully classy. Our Iroko worktops, just like all our wooden surfaces, are responsibly sourced. This means when you buy your worktops from HC Supplies, you’re helping protect natural Iroko sources. Including our Iroko kitchen worktops, all our wooden worktops come in a variety of width fittings, and are easy to shape and sand down to perfection. With HC Supplies, you know you're getting reliable, durable and only the best quality Iroko worktop for your kitchen. When something simple just doesn't match the glamour of your new kitchen, try something truly unique like our Iroko worktops! 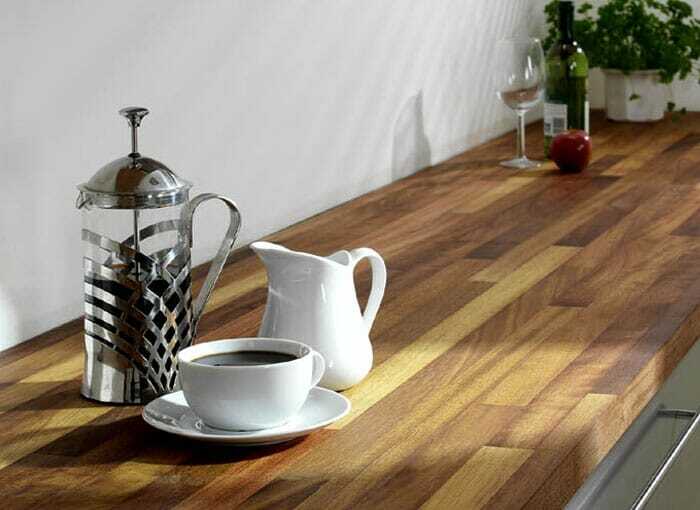 Our Iroko worktops offer an affordable touch of luxury to a host of kitchen designs. One of our Iroko worktops in your kitchen will wear extremely well and become even more beautiful with age. When newly fitted, your Iroko worktop will start as a distinctive yellow colour that will mature beautifully over time into an intense bronze colour. This process is helped by natural sunlight and many of our customers have commented on just how exciting it is to watch this process happen before their very eyes!! Here at HC Supplies, we have been providing the UK with solid wood kitchen worktops for years and are committed to providing responsibly sourced worktops. Including our Iroko kitchen worktops range, choose from Solid oak worktops, Beech Kitchen worktops, Walnut kitchen worktops, Maple Kitchen worktops, Zebrano worktops and so much more! Each of our Iroko worktop offers you something different in terms of style and with a massive number of different grain patterns from which to choose, you can be sure of finding your perfect Iroko kitchen worktop here at HC Supplies. At HC Supplies we believe we offer the best Iroko worktop selection at the best prices around and offer a no fuss guarantee for your 100% satisfaction. Our range of Iroko worktops are readily available and we can normally deliver your worktop within just 2-7 working days!